UNISON is the public service union, where workers from a wide variety of sectors and roles come together to get a better deal. UNISON members working in the same sector, such as local government or healthcare, are represented through service groups. Service group executives are elected by members to deal with strategy and issues. UNISON is the UK’s largest healthcare union with over 400,000 members who work in the NHS and for private firms and charities providing NHS services. UNISON cares passionately about the future of the NHS as a publicly funded services that is free at the point of delivery. Campaigning to defend the NHS is a key priority for the union both in the South West region and nationally. Find out about the work of UNISON members working in health across the UK. Find out about the work of UNISON members working in education. Our members in the Environment Agency work in clerical, administrative, technical, professional and scientific jobs and UNISON is the largest trade union recognised by the agency. Consequently UNISON takes the lead role on all employment related issues. Find out about the work of UNISON members working in water, environment or transport across the UK. Find out about the work of UNISON members in the community sector on UNISON’s national site. UNISON represents the interests of a wide range of probation workers including case administrators, managers, cleaners, cooks, probation service officers, hostel staff, and victim liaison officers. Our fastest growing service group, UNISON supports over 67,000 members employed by private companies working across public services – hospital cleaners, environmental health officers, school meals workers and call centre workers. 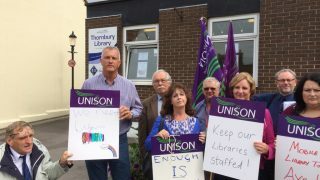 These members face particular challenges which UNISON is dedicated to meeting.